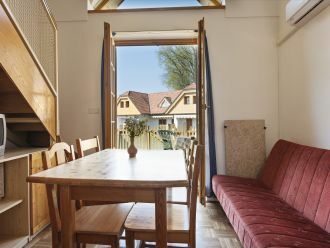 The Prekmurska vas Apartment Village is made up of a cluster of houses giving the impression of a typical Prekmurje village. Houses in the midst of green plains next to the Terme 3000 Thermal Park give you the option of creating your own schedule. All apartments have a fully appointed kitchen so you can prepare a breakfast for yourself even in the afternoon if you so desire! 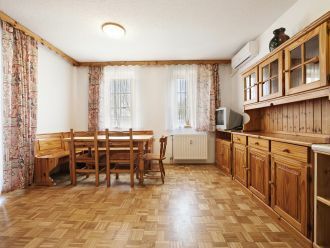 Apartments are often chosen by families, cyclists and those wishing to be somewhat removed from the hustle and bustle of the hotel during their vacation. Vacations in the midst of the nature of Prekmurje beckon you to have an active break from your everyday life! The four-star apartment village comprises 37 apartments (7 apartments for 5 persons, 7 apartments for 3 + 1 persons and 23 apartments for 2 + 1 persons) next to the Terme 3000 Thermal Park. Apartments are located in two-storey houses (the upper floors are only accessible by a stairway), each with its own private entrance. Each house contains several apartments. All apartments feature a view of the park, are heated and air-conditioned, and also have a balcony with a sofa set. In addition to the room/-s, the apartments feature a furnished kitchen (dishes, cook top, refrigerator and oven), living area and bathroom with a shower stall. Apartment guests have free entry to the Terme 3000 Thermal Park, which features indoor and outdoor sections, as well as the swimming pools of the Hotel Termal (themed indoor swimming pool complex and 2 outdoor swimming pools). The Terme 3000 Thermal Park is open from 9.00 to 21.00 (October–May) or from 8.00 to 21.00 (June–September). The world of saunas is open from 10.00 to 22.00. The swimming pools of the Hotel Termal are open year-round, i.e. every day from 6.00 to 20.00. Hotel guests take their meals under half-board arrangements at the Hotel Termal located in the immediate vicinity of the apartment village. The Hotel Termal runs the Termal hotel restaurant offering a Prekmurje-style dinner. The Cafe Praline is also part of the resort and has a daily fresh offer of local desserts and sweets made using local ingredients. Room service is available daily from 7.00 to 23.00. Breakfast is served from 7.00 to 10.00, lunch is served from 12.00 to 14.00, and dinner is served from 18.00 to 21.00. The Cafe Praline is open from 9.00 to 21.00 (September–May) or from 8.00 to 23.00 (June–August). Apartment guests get free entry to the hotel sauna (Turkish) of the Hotel Termal. Guests can also visit the Thermalium Medico-Wellness Centre, which is part of the Terme 3000 resort offering a wide range of wellness services with a Pannonian note, baths and cosmetic services as well as special medico-wellness services; the Terme 3000 Medical Centre offers rehabilitation for osteoporosis, joint and back pain and non-infectious skin disorders, as well as a wide range of physiotherapy services. The hotel sauna is open on weekdays from 7.00 to 21.00, on Saturdays from 12.00 to 20.00, and on Sundays from 14.00 to 20.00. The Thermalium Medico-Wellness Centre is open from 8.00 to 19.00 (Sundays until 16.00), while the Terme 3000 Medical Centre is open from x.00 to x.00 (Mondays through Fridays). Terme 3000 features an 18-hole golf course. During the season, the course is open from 8.00 to 22.00, while the driving range is open from 10.00 to 19.00. The course offers golf cart and equipment rental. The offer also includes courses and a golf school. Terme 3000 – Moravske Toplice is located in the northeasternmost part of Slovenia. Leave the Pomurje motorway at the Gančani exit, which also shows the exit for Moravske Toplice. In Bogojina, turn left towards Moravske Toplice. After arriving at Moravske Toplice, the Hotel Livada will be on your left. Ljubljana is 185 km away, Trieste is 285 km away, Venice is 435 km away, Munich is 505 km away, Graz is 125 km away, Vienna is 235 km away, Budapest is 290 km away, Zagreb is 165 km away, and Belgrade is 535 km away. The bus stop is 200 m away and the bus central station is 5 km from the hotel. The Maribor airport is 50 km away. Rules on cancellation and prepayment vary depending on the room type or package. Please check when making the reservation. A spacious and comfortable apartment for three with a 160 cm wide king size bed and view of the park. The apartment (50 m2) features a bathroom with shower and toilet, desk and dinner table, additional bed and a kitchenette. A spacious and comfortable apartment for five with two 160 cm wide king size beds and view of the park. The apartment (80 m2) features a bathroom with shower and toilet, desk and dinner table, additional bed and a kitchenette. A spacious and comfortable apartment for four with a 160 cm wide king size bed and view of the park. The apartment (70 m2) features a bathroom with shower and toilet, desk and dinner table, sofa set and a kitchenette. Terme 3000 – the opulence of everything that is good! Terme 3000 – Moravske Toplice is one of the largest thermal spas in Slovenia. At the heart of their services is a close connection with the Prekmurje plains. Hotel Termal is situated next to the Terme 3000 Thermal Park, one of the largest water parks in Slovenia. Admission is free for hotel guests. The indo ...or and outdoor facilities of the Terme 3000 Thermal Park include thermal, swimming and children's swimming pools, adrenaline and family waterslides as well as adrenaline attractions such as trampolines and the zipline that runs over the swimming pools. In the summer, the tall trees offer plenty of natural shade for everyone! We make sure that recreation is fun at Terme 3000. Our daily programme of guided workouts comprises a combination of water workouts, workouts on dry l ...and and a range of sports courses. Participation in most activities is free of charge for guests of Hotel Ajda. The sports park has a variety of courts and pitches. Sports equipment is available to rent. The area around the resort features a number of cycling trails, while golf enthusiasts can take advantage of the golf course next to the resort, which boasts the longest fairway in Slovenia. The mascot of Terme 3000, Viki the Stork, teaches children about the importance of movement and makes sure they get plenty of fresh air. The activitie ...s programme is especially rich during school and public holidays. Families can visit the playroom offering board and other games, as well as books. Kids can play on the outdoor playground sets and trampolines at the Terme 3000 Thermal Park in the summer, and there are numerous family excursion spots in the area of the thermal spa. Do not miss the offer with discounts for children! The Hotel Termal indoor pool complex brings together the beneficial properties of thermal water, the power of stones and chromotherapy in the poolside ... relaxation room. On the crystal path, you can absorb the soothing energy of various crystals. Chromotherapy with colours and coloured lights helps balance the energies of the body, thus contributing to well-being. Hotel Termal also has two outdoor swimming pools, one with unfiltered black thermal water and the other with filtered thermal water. The black thermal mineral water from Terme 3000 is the warmest thermal water in Slovenia. After bathing in it, the entire organism is more relaxed, to ...ned and refreshed. The water also improves the blood and lymphatic circulation, strengthens the immune system and alleviates pain. Hotel Termal guests can experience its power in the outdoor hotel pool filled with unfiltered black water. They also have free admission to the Terme 3000 Thermal Park, which features an indoor and outdoor black water pool in addition to other swimming pools. Prekmurje cuisine is simple but richly flavoured, with dishes made using local ingredients. Typical ingredients include buckwheat, pumpkin seed oil an ...d Zaseka (minced lard), while desserts often include poppy seeds. The self-service restaurant of Hotel Termal offers tastings of Prekmurje dishes and dishes made using typical local ingredients. The restaurant has an extensive menu to suit every taste. The Prekmurje layer cake – the queen of desserts – is made fresh every day at Café Praline, situated just a few steps from the Hotel Termal. Prekmurje is characterised by the Mura River, the Pannonian plains and the hilly landscape of nearby Goričko. This is where joy intertwines with reverie, playfulness plays with calm, and modernity mixes with a genuine connection with nature. They often say that once you visit Prekmurje, you will keep coming back. Just like the storks, autochthonous big birds of this region, that find their way back to their native Prekmurje village each spring. Take a look at the offer of organised outings for the guests of Terme 3000See what the surroundings of Term 3000 have to offer!